SUZANNE PRITCHARD: Hi, I’m Suzanne Pritchard. I’m an occupational therapist and certified driver rehab specialist at Easter Seals Crossroads, and this is your Assistive Technology Update. WADE WINGLER: Hi, this is Wade Wingler with the INDATA Project at Easter Seals Crossroads in Indiana with your Assistive Technology Update, a weekly dose of information that keeps you up-to-date on the latest developments in the field of technology designed to assist people with disabilities and special needs. 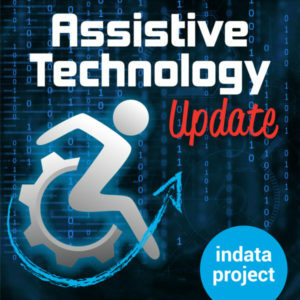 Welcome to episode number 376 of Assistive Technology Update. It’s scheduled to be released on August 10, 2018. Today we are going to get into a topic that I think is fascinating and going to be interesting to a lot of people. I’m going to spend time with my friend Suzanne Pritchard, who is an occupational therapist and certified driver rehabilitation specialist here at Easter Seals Crossroads, talking about the ins and outs of driving for people who have autism. We hope you check out our website at EasterSealsTech.com. Send us a note on Twitter @INDATA Project. Or call our listener line. We love to hear from you. The number is 317-721-7124. Do you have assistive technology questions? We have answers. Check out our other show, Assistive Technology Frequently Asked Questions, or ATFAQ, at ATFAQshow.com, or wherever you get your podcast. SUZANNE PRITCHARD: I block it out. WADE WINGLER: And records when we are not here. She’s doing voiceovers for Amazon commercials or something. Suzanne, welcome. SUZANNE PRITCHARD: Thank you. I’m so glad to be back. WADE WINGLER: We are excited to have you. You’re just a hoot so it’s fun to have you in the studio, because we are going to talk about something serious but I think we are going to have some fun doing it. Before we get into the topic at hand on autism and driving, tell folks a little bit about you, your background, how you became interested in people with disabilities and their need for driving. Tell us your story. SUZANNE PRITCHARD: Sure, easy. You are just lobbing these questions at me. WADE WINGLER: You should know the answers. SUZANNE PRITCHARD: I know the answer for this. I am an occupational therapist. I got my Masters degree a while ago. When I finished graduate school, I decided I wanted to work mostly with folks who have had a brain injury, some type of neuro- event or spinal cord injury, stroke, things like that. At my work at the hospital, it became really apparent that returning to driving was almost always at the forefront of someone schools to get back to where they were. So if you use after that, I had a client who essentially his only goal was to return to driving. I thought, I have to dig further into this and see how I can get invested in this part of rehab and recovery for folks. So I came across Easter Seals Crossroads. It has an excellent program. I decided I would land here as an occupational therapist what I was then given the opportunity to get my certification in driver rehab, and here I am still, to this day. WADE WINGLER: And we are glad that you are. How many years? WADE WINGLER: Wow, just a baby. You’re just getting started. SUZANNE PRITCHARD: I know. Mr. Oldie over there. 25, 30. WADE WINGLER: 25 — you said 30! SUZANNE PRITCHARD: I lost count. WADE WINGLER: That stuff I put in my hair is not doing its job. SUZANNE PRITCHARD: It’s not. I can see it. WADE WINGLER: You mentioned CDRS. Tell me just a little bit about what that means and why that matters. SUZANNE PRITCHARD: Certified driver rehab specialists are those folks that do driver rehab for people with disabilities to get them to return to driving or begin driving and I focus solely on folks with disabilities. So different than maybe a certified driver instructor, that someone you might typically see as a high schooler teaching folks to drive. WADE WINGLER: Part-time viable coach, part-time driving. SUZANNE PRITCHARD: Right. But the certification to become a driver rehabilitation specialist comes from this organization called ADED [The Association for Driver Rehabilitation Specialists]. They have certain — you have to pass an exam to be able to get that certification. You have to have so many continuing education credits for every year after that and submit those. Essentially folks that are CDRS’s tend to work full-time in the field and have a lot of experience with the population of folks that have disabilities. WADE WINGLER: It sounds a little bit like the ATP credential in my experience, where you have a degree, you have a discipline, but then you demonstrate work history and your degree and a certain number of hours of continuing education, has a test and that kind of stuff to keep it up. SUZANNE PRITCHARD: That’s right. You’ll see folks in the community that will call themselves driver rehab specialists. They don’t have that certification. They might have that work history, the experience, but they haven’t proven that are credential that this certification calls for through ADED. WADE WINGLER: Absolutely. So tell us — because you are not doing driving services for folks with autism all the time or exclusively. We are going to get into that. But what is a day in the life like for you? I know the answer to this question because we talk about it on a pretty regular basis, but tell our folks in the audience what’s a day in the life look like for you if there were to be a regular day in the life? SUZANNE PRITCHARD: If I’m not joyfully doing a podcast, then I tend to be in the car a lot, of course. We see folks who are as young as 15, who have a permit — I think my oldest client has been 97. We see folks across the age range. We see folks with all sorts of disabilities, folks that have had some sort of event in their life, a brain injury, spinal cord injury. Sometimes folks might acquire something like multiple sclerosis and need equipment to drive. Sometimes folks get on the older side of our age spectrum, and they have a cognitive impairment of some sort, dementia, Parkinson’s, something like that, and we evaluate those folks to determine their fitness to drive. On the younger end of the spectrum, we see a lot of folks who are new drivers that have autism, cerebral palsy, might have a visual impairment of some sort. We really see a whole spectrum of folks who have all very abilities and experience driving. Like I said, sometimes folks have driven before and sometimes they haven’t. While driving is always the focus, it’s never a dull moment because we have a whole variety of folks that come in, which makes our job exciting and fun. WADE WINGLER: The vehicles you use are kind of like drivers and cars. You have a brake and you are constantly putting yourself in the physical position to be able to take control of the wheel and those kinds of things. There are some high excitement moments? SUZANNE PRITCHARD: Yes, which is why sometimes I do like these podcast because I’m just sitting here in this very stable chair, not hurtling down the street at 50 miles an hour. We have a couple of vehicles that have brake and gas pedals on the passenger side. We have event as well with all sorts of souped-up equipment that has a brake and gas pedal on the passenger side. SUZANNE PRITCHARD: Fancy new cars. WADE WINGLER: Here’s a simple, perhaps bold no-brainer question to start us on the topic of autism. Can people with autism drive? SUZANNE PRITCHARD: That’s a good question. WADE WINGLER: It probably has some new wants to the answer. SUZANNE PRITCHARD: How much time do we have? WADE WINGLER: We have some time. Keep going. SUZANNE PRITCHARD: The answer to your question, which is a good one, is it yes, certainly people with autism can drive. It has all sorts of factors that we need to look at. That is what we are trying to do. That is what our valuation is about, to determine with a decent ability to predict their success after an evaluation, is if this person does have the skills, should they pursue drivers training. The variability, as it is with any new driver — let’s just start with our new drivers. There is going to be the same components for someone with autism as there are for those, let’s say typical, high schooler, where there is a cognitive component to driving. There is visual spatial skills. There is a motor skills. There is a social skills to driving. While the young person with autism may have challenges and all those areas and any aspect of their life, whether it is learning to drive a bike, learning and keeping friends, being able to carry over information from one setting to the next in a classroom. All those skills need to happen in a vehicle, and we need to determine what their abilities are and how we can strategize and make that happen for them. WADE WINGLER: A lot of the stuff you just rattled off are things I think we take for granted, right? WADE WINGLER: In a couple of hours, I’m going to get in my car and drive home. For two and you won’t even think about it. WADE WINGLER: I won’t think about the task analysis, the breakdown of all the skills and steps related to that. That’s where you live. That’s the pool you swim in all the time. SUZANNE PRITCHARD: Absolutely. And so we can see things. Part of our evaluation will say, it’s a blurb about divided attention skills. If I were to ask you that, what divided attention skills should you use in a vehicle, you would likely give me an example of some really complex scenario where you are attending to multiple things at a time, processing in a nanosecond, prioritizing stimuli. Sometimes where we start with our consumers is can they divide their attention between holding the wheel straight, going 10 miles an hour, putting the brakes on the car, and don’t move the wheel. I’m giving a visual here, but a lot of times you brake, and their focusing so hard on the braking that they actually start to turn the wheel unintentionally. They are just not able to do those two things at the same time. Sometimes that’s where we start. Can we build on those skills? WADE WINGLER: It reminds me of when I’m teaching my kids how to ride their bike. I say, your bike goes where your eyes go. They unintentionally turn all the time. I’m like, keep your eyes where you want your bike to go and you are more likely to get there. SUZANNE PRITCHARD: That’s right. Interesting that you mention the bike. We ask almost all of our consumers and their families — again, we are referring to the new driver, typically with autism. Any diagnosis, but we will stick with our podcast. That’s how they learn how to ride a bike. Were they successful with that? That’s an interesting piece. A lot of people say, well, does that mean we can or can’t pursue driving? Not necessarily, but that’s a good place to start learning the skills. WADE WINGLER: A lot of the same things happening there. You talked a little bit about eval and some of the processes that go into it. What is the overall process? A family says, hey, I want to drive, or our child wants to drive. What does the process look like from that moment of realization to we’ve made a decision about whether driving is going to happen and is happening? SUZANNE PRITCHARD: I’ll stick specifically with Easter Seals Crossroads because there are other agencies that offer similar services but might have a different process. We ask that all of our new drivers come to us with a permit. Sometimes parents say, I don’t want them to go get that permit if they aren’t going to be able to pursue driving. Even if we could say definitely we are going to have the person pursue training, who would never be able to guarantee licensure anyway. We do ask for that. We think it’s important that the student would take the time to study the initiation to get that permit. That’s the first step, let’s try to get that permit. We then would sign the person up for an evaluation. That’s about three hours or so. They spend it one-on-one with one of us here in the department. There are a lot of clinical assessments we do to determine visual processing speed, reaction time. We like to have nice conversations with the consumer and family, caregivers about their life skills and how they’re managing themselves outside of the car. Then we actually get them in a vehicle. That’s one reason for the vehicle, as we want to stay legal. WADE WINGLER: Breaking the law, avoid that. SUZANNE PRITCHARD: We try to avoid that. We do a drive with them and sort of me them where they are. We have folks who come in, they have actually never sat in a driver’s seat. We will start with them in an overflow parking lot. Sometimes people have given a number of hours with their parents or even a driver instructor, so we can up the ante a little bit and do more driving. We then can determine at the that evaluation if the person is appropriate to be in our program and start consistent training with one of the CDRS’s here. Throughout the training, as you can imagine, the goal of the evaluation is to determine not if the person will be a driver but if they will be in a program. Through each session, we like to get is not just feedback to the consumer but today caregiver or parents, family, to say where we are now. It’s a constant reassessment. There has to be time for practice and repetition, time for them to be able to learn a concept and carry it over, a time for them to practice. We do ask folks to practice without us. And then we kind of keep going because we have consumers that look great the first couple of weeks, and then we kind of hit this plateau. How or it can we get them over that wall to keep going? At the end of school training is one we would say, go forth, take her driver’s test at the BMV. We might say, skill the training is complete but we want you to keep driving with your folks for a while to get more experience. There are a number of different outcomes. I would encourage families that want to pursue that to call us. We are always happy to talk to anyone on the front end, talk more specifically about the consumer and get them started down the right path. We invite you to call us. WADE WINGLER: It’s interesting, I know a lot about the program. We’ve talked about it a number of times. I’ve always envisioned this — Crossroads, right? Are we going to become a driver or not? I hadn’t thought about the fact that you kind of have to constantly say yes, and say yes again, and say yes again. And there are a number of opportunities for the process to stop or change or whatever. WADE WINGLER: There are probably when you get to give people good dues and say yes, you are in the program, or yes, you’ve progressed to the point where it does make sense for you to go take her driver’s test. And then there are probably days — I know there are because we talk about them — where you have to give the bad news is a driving isn’t going to happen, or isn’t going to happen right now. Tell me some of those highs and lows. What is that conversation like? How does it go? SUZANNE PRITCHARD: No doubt, the lows of the job — the reason we do this job as we know how important it is in this country, particularly in this city in central Indiana and across the state, that driving means independence. It’s not just independence for the consumer, but for our younger drivers, there is some independence for the family. Now the family is not the transportation option. It’s the actual person that has the job, goes to school. When we have to determine news where it’s not ideal, either you are not going to be a driver, or we anticipate that you won’t be a driver, or that is not going to happen now, is very painful, no matter how or when it’s delivered. What we try to do here is be clear and honest throughout the whole process and to identify the challenges that we see and identify ways that we think that will help redirect those challenges and help them move on from that and keep driving and make sense of complex situations. We try to give that support to the family because we need them involved. There are times when there is just no magic wand, and we have to say it’s not going to happen now. There a time when we say we like to think that that will never happen. We try to transition them to being a passenger and taking advantage of the different transportation options in town. We work hard to not have that be an unexpected bomb dropped on anybody, everyone that to be a constant conversation. Like I said, we are honest about each step of the way. On the flipside — and I can give you lots of examples which makes me so happy to share. An example of a young man, he lives on the north side of Indianapolis. He came to us, having driven a few times in high school. He’s tried at 16 to do the typical drivers education. He completed that series of drives, which I believe is about six drives. He did not feel comfortable. If I can recall, the driver instructor said not now, but let him keep practicing. But the family wanted a little bit more. A couple of years after high school, he was now taking college classes in town locally. He was about 19 or 20 at this point. He and I ended up spending nearly 25 hours of driving together. We finished our skilled training, and I felt like we had our goals of his skills and what I could impart to him. He and his family had decided that they weren’t wanting to take the drivers test at the time. I said, of course, that’s fine. Let’s go on your schedule. I sort of signed off and said be in touch. About a year later, I got an email from mom that said we just wanted to thank you. This young man just took his drivers test yesterday. He passed. He has purchased a used vehicle for himself. You know drives himself to his classes. He has an internship. He’s about to graduate and get employment. Those are such nice highlights in our job because it was on his timeline. From start to finish, meeting me to licensure, was about almost 2 years. But here he is. He can do so much now with his life. That was one of my highlight stories. WADE WINGLER: That’s great. That’s the reason you are in it, is for those moments. They had better happen every once in a while. SUZANNE PRITCHARD: Or I’m not ever leaving this podcast room. WADE WINGLER: So when we are talking specifically about individuals on the autism spectrum and driving, what are some of the accommodations or strategies and challenges that you see pretty regularly, and if you examples you might work to overcome those? SUZANNE PRITCHARD: There are a number of different ways I can answer this question, so that we down if I go down a rabbit hole and you want me to come back out. Let me just say again, there is no magic wand for this. What we hope to provide is consistent, calm intervention. We know that as parents, that can be really hard to do. They don’t necessarily have the [Inaudible] on their side. We can offer common feedback. Feedback from an outside source tend to be better received from folks. I think that already gives us a leg up. We have great resources here, not just our certification and continuing education, but we have great resources with our Autism Research Center. My coworker and I are constantly learning and absorbing information about autism. What we’ve learned is that a couple of basic things are very clear, concise information in the car. Something basic might be if I’m driving with you, Wade, and you and I are trying to get somewhere, I might say, Wade, I need you to make a left up here. Well, if I just say up here, you as a previous driver, neuro-typical, could probably conclude that I mean at that traffic light. But that is not necessarily the case for someone with autism. They may take that very literally and immediately turned us to the left that’s not a place to turn. A lot of concise information, understanding how that particular student learns, even in a classroom with more traditional academic information and to translate that into our instructions in the car, just a lot of repetition. A lot of strategies we can impart to the families, so speaking in the same thing was that we speak. So when we say things like who has the right-of-way here? To make sure that everybody is using those same terms. Versus who gets to go here. Even simple things like that. We also need that family support because intervention we provide is really just a small piece of what folks ultimately need for this long haul to pass their drivers test and become functional drivers. We are not just looking at having folks get their license. We want them to actually be driving. We are participating in a study right now and picking apart our new drivers with autism that have, quote, passed the program. What our piece is about, their cases that made them successful, if you will. If I would answer the question by now before we finish the study, I would say family support. Do they have someone that’s willing to drive with them and practice? Repetition, listen to what we are saying and implement those strategies? What are their life skills before they come to us? How are they managing themselves outside of the car? If, as a parent, you won’t let your kid ride their bike by themselves on a street or across a busy street or stay at home alone by themselves, or you manage your schedule very — what’s the word I want? SUZANNE PRITCHARD: Yeah. Then maybe that student isn’t quite ready to be in a 2000 pound car going 45 miles an hour, making cognitive decisions in a nanosecond. We look at what all those life skills are like. We also take into consideration IQ. We take into consideration other aspects of their medical history. We don’t necessarily see folks that have a diagnosis of autism that also don’t necessarily — that’s not where the story ends. There might be anxiety that comes along, or depression, attention, visual processing issues, things like that, even motor coordination. We want to look at all those things and address them and figure out how to manage that and see if I can translate into the vehicle. WADE WINGLER: Fascinating stuff. We are running out of time for the interview today. We could do this all day, and we just might that after we record. If people are interested in reaching out to you and the driving program here, how should they? And then what if they are not in Indiana? What advice would you have? SUZANNE PRITCHARD: I would say to get a hold of us at crossroads, you can go to our website, which is EasterSealsCrossroads.org and look at us there. You can email us. You can give us a call at 317-466-1000. I hope that’s okay, then I just put that out there. Asked for the driving program. If you are not in the state of Indiana, you can go to the website ADED.net, that’s A-D-E-D dot net. You can look for a certified driver rehabilitation specialist in your area. I would also recommend to check that website out because there are lots of resources and links to all sorts of disabilities and what to look for in relation to driving. I would definitely say to check that out. WADE WINGLER: Suzanne Pritchard is an occupational therapist and Certified Driver Rehabilitation Specialist. Thank you so much for hanging out with us.